Who have been around for a while. A keeper that may bring back memories or instruct. This is Black American History at its best!!! going all the way back to 1950. 1950 1960 1965 1970 1975 1980 1985 1990 1995 2000 2005 ENJOY!!! This entry has helped many readers sell their JET magazines. Apt #304 – 437 Jarvis Street. As a grade school student in the late 1950s, I whiled away many Saturday mornings waiting to have my hair cut at Joseah’s Barbershop in Chester, Pa., the once-muscular factory town south of Philadelphia where I grew up. It is unremarkable today to see African-Americans and whites sitting side-by-side in hair salons. But in the age of American apartheid — even in the North — beauty and hair-care services were segregated by race. Black doctors, judges, truckers and laborers were pressed together while they waited to be shorn. They talked sports or politics and thumbed through magazines and newspapers. There were the standard white publications — The Philadelphia Inquirer, Look, Life,Field & Stream. But there were also magazines that most white people never saw and that offered views of black achievement and middle class normalcy that were largely excluded from the white press. I remember reading in Jet sometime back in the 80’s ( I think) there was a White student from a University in Connecticut that wanted to know if the complaints made by Black America was justified. He had the pigment of his skin changed & stated South he lasted 2 weeks when he got to Georgia. He could take no longer…. I would like to have this article. I am looking for a July, 1956 issue with an article about the governor forcing a black man named Lawson out of the state because he had a white war bride with him. Can you help Brenda in regard to selling her old Jet Magazines or s tell her the nest way to advertise her products. I have Jet magazines for the 80’s and would like to see them, would you have any suggestions as to how? Dear Shirley, I would love to buy one Jet Mag in particular that features Jet Beauty Veronica Davis. I believe that it was a late 85 issue. Please let me know if you have it and how much you want for it. Thank you very much. Brenda please contact me if you still have old jet magazines 1955-1960. hbd100@sbcglobal.net. Carter G Woodson library or donate them to the museum of African American History, whose late founder was Dr. Margaret Burroughs. Both places are located in Chicago as well as Ebony/jet magazine. For your information Ebony building has been sold; can’t say if ebony magazines is still printing. It was a sad day to see that building go, and by the way, the building was purchased ‘cash’ prompto…someone had the money…Its founder was John H. Johnson, who started the magazine with 500 dollars. He has passed on. A bit of history from what I was told, because he was a blackman he could not purchased the bulding; however, a white friend of his purchased the building and later handed it over to him. Don’t like to think of those days, what black people had to do to survive, ebony magazine being one of them among many human interest stories. This is just GREAT. THANKS. Are copies freom Nov 10, 1955 to October 31, 1957 available? How much are Jet magazines from the 50s and 60s worth? I have old jet magazines that I have been trying to sell where else besides eBay can I go to? Michael Jackson,Hershel walker, etc. and also have ebony mag. Trying to sell as well please all input could help thank you ! Are these still available? Email me benshelley[at]zoho[dot]com! How manuy copies (of any and all issues) do you have and how much are you selling them for? How do I go about getting 10 copies of the August 1974 Jet???? I really need them before the Holidays?? Do you still have any old Jets? I have looking for it a long time. Does anyone have September. 3 1959. Do you have October 27th 1957 issue? Holding boxes of old magz of JET to current ones 305 767 6217 let ya fingers do the walking…. cheap ones must sell collecting dust. My name is James I have about 200 jet magazines ranging from 1952-1970 I’m trying to sell them, they are in very good condition most are in mint condition if interested please email me at mistermoney52@gmail.com thank you. This is not a commercial site, but we will not prevent you from offering your books for sale. However, we would appreciate small donations to help to keep this website operational, as it depends on donations to pay its expenses. Would you would like to make a donation? – Send an e-mail to cybryan@gmail.com or guyaneseonline@gmail.com and I will tell you where to send your donations. Hello James. My name is Katherine. Back in 1957 or 1958 my family was featured in a Jet Magazine. The article was about either an “International Family” or a white couple that adopted a Black child. Sam and Katie Roberts’ They lived in California. Long Beach, I’m certain the article coincided with one that come out in Ebony about the same time. The Ebony Magazine had a Black singer on the cover in a red dress. Something about the Black Marilyn Monroe. If you can help me with this matter I would greatly appreciate it. Thanking you in advance. My email is belindafrey0@gmail.com. Katherine, you can look up such things on Google Books now. Here is the link to the issue you want from April 28, 1966. You can also read the full issue and see all pics there. And if you are interesting in purchasing a copy for yourself, there is a “Buy It Now” listing on eBay for $9.99. Does anyone have any of the following jet magazines for sale? My name is Jesse Alston. I have all issues from Jan. 91 to 2007 if you’re still interested…. I don’t have any that I want to purchase. I have Jet Magazines from the 60’s that I want to sell. Another person contacted me wanting to know if someone wanted to purchase Jet from the 50’s. Her name is Brenda Price. I hope you people are making a donation to Cyril Bryan, who is taking the time and creativity to make this forum available to us. In case it slipped your mind – just saying. Advertising in Guyanese Online Blog and Newsletter. Note: Guyanese Online does not have a bank account so cheques/checks must be made to Cyril Bryan. I have a December 1965 jet magazine in perfect condition with Daphne Dumas I would love to sell. I am looking for the September 1977 issue of Jet Magazine, where the Photo of the week was myself, DeLanda Groomer, wearing the Brockambrella. My Dad passed away recently. He was a collectors of Jet magazine. Delanda groomer are you still wanting the issue you were in? I have almost from the first issue to most recent. Really was hoping to sell them as a group rather than one on one. They are in mint condition. Email me at lawwoman10@yahoo.com. Thanks. This Blog entry has helped many readers sell their JET magazines. I have a friend that posed in 1976 and was a part of the calendar for that year; would you happen to have that available? Thanks in advance for your reply. I have some old jet magazines for sell can you please contact me at this email address if your interested in buying them I would like to know how much your offering for each I have 12 form 1958-1968. How much are the Jet Magazines and Ebony Magazines regarding Obama’s election win and inauguration? I am looking for the Sep 15 1955 edition of jet. Please email me at nicholasmcleod@gmail.com if you have one and are interested in selling. I just got done seeing SELMA, with my dad and my two kids. My dad was a freedom rider, back in the day. He is in the picture on the July 8, 1965 issue, page 4. He had mentioned in passing that his picture was in JET magazine, and I was able to find it. THANK YOU SO MUCH for allowing me to share this. 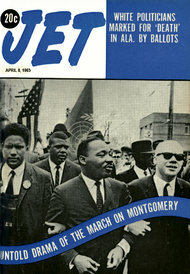 I have a January 14, 1960 featuring Damita Jo on the cover,from the Red Caps. My name is Chris Cooper, we have come across two very old jet magazines in good condition. We have the Dec. 3, 1953, and the march 8, 1956 production. 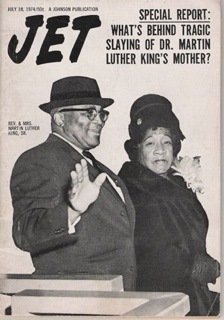 The 1956 magazine has an article regarding M.LK and issues in Selma. We would like to sell these two copies, any serious inquiries please text 317 626 9810. I am interested in an article featured in Jet magazine around late eighties about a black family of four (mom, dad, sister & brother) that all graduated from the same university in Mississippi. I have a lot of issues from 1970’s to 1997 and I wanted to get the value of each does anyone know where to go for that info. I am looking for an edition of Jet that contains an article on John and Sarah Collins. They were given a Good citizenship award for Tallapoosa ,Ga. I’m not certain of the year. Also known as Aunt Sarah, Her obituary was in an edition of Jet ,also. Do you have any idea of the year? I’d like to buy the Jet Magazine dated March 17, 1997. Does anyone have a copy by any chance? Two copies would be much better. Anyone? Good to you, sir. My dad, Ernest Ford father,Peter Ford was featured in Jet Magazine in 1959 as a traveling minister heading to Africa. I’m helping him with his ancestry search and would appreciate your assistance in locating the article. Peter Ford, unfortunately was murdered in Manhattan,NY in 1962. I am looking for an article about a Thomas Jackson from morehead city, NC. They did an article about how he directed traffic just because and not sure of the date, but it stated that he had passed. Does anyone have that article? The reason is I have been searching for my father and his name is Thomas Jackson, from Morehead City, NC, Beaufort County. Thank you in advance. IT as just a small blurp and a pic. I have jet magazines from 1980-2006.3 Ebony magazines dated 1993,4,5, Michigan Chronicle , Detroit , Obama . These are for sale ,interested , serious, contact me via email . I need Jet Magazine 4/27/1987. Please let me know if you have this publication of Jet. Stop all this talk about Jet Blue. That is ancient stuff. Enough. I knew the first black soldier to desert to Sweden from Vietnam on cover of Jet with his Danish girlfriend, does anyone have it? My grandfather is from Starkville MS he was the biggest house contractor there his Last name is Nicks he had 5 boys & 3 girls i heard he was feature in jet mag. Can you help me find this article? The old Jet magazines that you have scanned on line are missing volumes between Nov. 1955 and October, 1957. Why were those vols. not included ? I was looking for a story that appeared probably some time within that period. It was written about a family in the Millington, TN area, where I grew up. I enjoyed reading some of the old stories. They brought back a lot of childhood memories. (A true reflection of our history as black people during that time). My mam is Ronald Humphrey and I participated in the arco jesse owen games in 1980. It was four of us,Houston Texas that set a record in the 4x100meter relay. I don’t recall what month,but if someone can please help me find that edition..I’ll be grateful. I believe the months were between May-September. The 4×100 names were Ronald Humphrey,Rodney Hampton,Mark Adams and Rory Ellis..in that order. Currently selling early 50’s and 60’s issues of JET on ebay. Perhaps I can fill a “gap”. I am looking for a Jet Magazine with Michael Jackson on the Cover, but is highlighting my brother Shannon Lilly a basketball player from Wilmer-Hutchins located in Dallas, Texas and a graduate of Bishop College of Dallas, Texas. He passed away and I am needing a print of this Jet. Please contact me at dedneal13@gmail.com. I am looking for a Jet or Ebony magazine that has a student named Arthur ‘Rip’ Payne. he wa a student at the North Carolina College for Negroes (now NCCU). He had a cigarette in his hand and staring with his legs crossed. I want to give this as a gift, need 2 copies. thanks. Do you have any copies of archived Ebony magazines in your stock? I am trying to locate huge article written about my recently deceased Mother back in the early 60’s, but not sure of the date, due to I was a very small child. Jet only seems to show one article in 1966. Her name was Saundra M. Lopez or incorrectly listed as Sandra M. Lopez. She was dubbed the little songbird of Chester. There are 4 people in pictures taken, my Mother, her two Aunts and myself. I cannot seem to locate it anywhere. House fire destroyed all magazines stored in attic. Please help me. I will pay anything to have them. I am looking for 1963 Jet/Ebony vol 18, #6 edition featuring my great aunt Mary Finkley Antiques in Harlem.. Looking for the June 29, 1961 issue. I am looking for an article that Robert and Frances Thomas was featured possible 1950 or after. Anyone knows where I can get a copy of JET issues August 24, 1961 and September 14, 1961. To1995. If you know a good place to sale them let me know. I’d like to buy Aug 19th 1996. I’m a Christian minister. I have an interesting story of my interaction with Celeste, and would love the copy of Jet available for folks to look through after the services where I share the story. My name is Kim when you get a chance please contact me about magazines. I remember reading an article in Jet back in the 80’s Natalie Cole’s mother went to court to have her found incompetent. The record company tried to come up with her mother but she won the court case and Natalie was admitted to a facility for 6 months, I would love to see and read this article again. Natalie’s mother Mrs. Maria Cole saved her daughter’s life. She was brave to come up against the record companies back in the day. I also have a Jan. 7,1954 issue. I AM LOOKING TO BUY THE JUNE 1, 1992 ISSUE OF JET WITH WHOOPI GOLDBERG ON THE COVER. DOES ANYONE HAVE IT FOR SALE? Hello, I’m looking for the month and year of Jet Magazine where Barbara Curry, Chicago, IL., was on the swimsuit page? She passed away in February of 2011? I know Curry is her maiden name! Please, if you could send her picture to my email, I would be grateful! I’m her nephew, her only brother’s oldest son!!! Please help me year ago Jet did a article on my uncle who was a medicinal doctor in Shelbyville Tn. His name is Dr. Fletcher Moncur, do you also have a picture of him? He is my grandfather brother. …. I’m looking for a 1958 jet between Sept. Oct. Nov. Dec. I have a classmate we graduated from college together. GRAMBLING STATE UNIVERSITY, at the time was GRAMBLING COLLEGE, her name was It’s True English, she made the jet magazine. A very unusual name. Would like to present to her as a Xmas gift. Hello, my name is Gigi and I am the oldest daughter of the late Augusta Jean Bluester aka “Gussie” , from Birmingham, Alabama. I would like and my siblings to get a copy of that issue and or the picture of our mother. She was a swimsuit model for Jet, we were told by older family members… I was born in 1958, so somewhere around the early to mid 50’s. Trying to locate the 1957 centerfold photo of Rosemarie Humphries from Detroit Mich.
Hello and Happy New Year! My name is Mrs Barbara Rumph and I live in Selma Al as Pastor’s wife to my hubby of 43 years and preaching even longer. We have been in Selma 35years and build 2 churches, starting on number 3. He was featured in Jet Magazine volume 83, No. 3, as the first Black Pastor to bring his church into the Selma Church Association and I would like to get some copies if possible as he celebrating his retirement this year, not from the churches but regular work to do full time Ministry and I need your assistance as soon as possible. My contact information is 401 3rd Ave. Selma Al 36701. My phone is; 334 412 0955. Thanks for your services to help make Selma Great Again!